People with hearing difficulties often find group situations more challenging than those without hearing difficulties because the main form of communication is usually verbal. However, people with hearing impairments can enjoy a new group situation with some fun ice breaker games and activities. Below are some excellent ways of introducing a group of hearing impaired people to each other while having fun and setting a comfortable atmosphere. Painting and craft making can be excellent activities for people with hearing difficulties as they encourage individuals to express themselves and interact on a different level. There isn't really a limit to hat type of art and craft you incorporate into your situation. You could get the group involved in model making, pencil drawing, clay modelling, sewing, charcoal drawing, watercolour painting and ceramics. All of these activities will help your group interact with one another without using formal methods of communication. 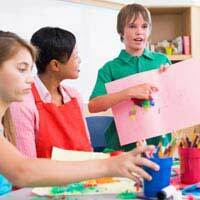 Arts and crafts can be a fantastic communication tool as long as the group are enjoying themselves and have fun. Dance can be an equally effective way of getting the group to have fun and feel comfortable with each other. The visual element of dance helps the group focus strongly on the activity and the people involved, which is why it works so well with those who have hearing difficulties. Dance can take any form and can be adjusted to suit your group. You could try an alternative to musical statues where you inform the group to dance when you are dancing and to stop and act like a statue when you stop. The first to move or last to become a statue is out of that round. Or you could get each individual to do a short piece of contemporary dance – you can also get them to do this in small groups if preferred. Alternatively, a dance routine can be a fun way for the group to interact and work as a team. Get the group to follow your dance steps. This is great fun for all. One of the oldest but favourite ice breaker games is often one greatly suited to those who have hearing difficulties. The treasure hunt requires team work as well visual awareness and also is just great fun for children and adults. Divide the group into smaller groups and have each team to search for the hidden clues or treats. Each clue or treat will have instructions of where to go next. This is an extremely effective ice breaker game for the hearing impaired and is, above all, a fun experience for everyone. This common ice breaker game also provides communication skills to the group. The game requires the group to incorporate different styles of communication to reach their goal, improves confidence and encourages the team to ask for help when necessary. As a goal is set the group are focusing on how to reach the end result so ignore the common emotions and feelings felt when entering a new group or situation.